It is with incredible sadness that the entire Francis family has to announce today, that our father and Hawaii 50th state BIG TIME Wrestling promoter and wrestler "Gentleman" Ed Francis, has passed away on November 18th, 2016 in Overland Park, Kansas at the age of 90. Ed Francis and his wrestling promotion was a Hawaiian institution in the 1960's and 1970's.... and there are still thousands of people in Hawaii today who keenly remember his unique brand TV wrestling showmanship. The Francis family wants to let all of the people in Hawaii and around the world that may have been touched by his colorful brand of wrestling, that he is now gone in body from this world, but NOT in spirit. Ed Francis' spirit will live on forever in the hearts and minds of those lucky enough to be alive during his wrestling heyday . Much Mahalo..... the entire Francis family. 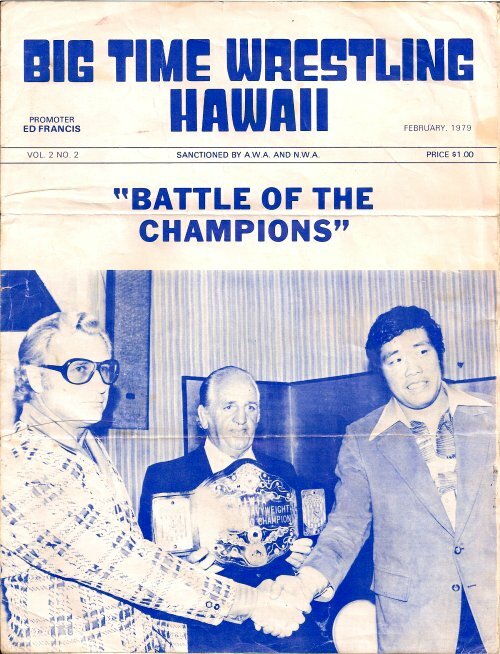 Ed Francis, along with Lord James "Tallyho" Blears, who passed away on March 3rd of this year (2016) after a long illness, were the 2 men most responsible for bringing Hawaii to the national forefront of professional wrestling during Hawaii's "Golden Age" in the 1960s-1970s. 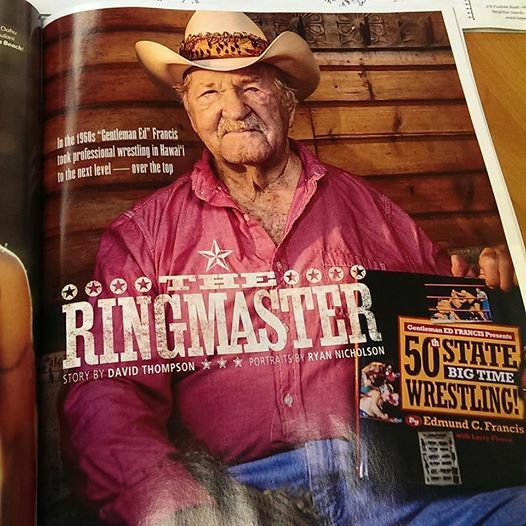 50th State Big Time Wrestling got its start on May 18, 1961 when promoter AL KARASICK, who promoted professional wrestling in Hawaii for 26 years, sold his territorial rights to ED FRANCIS. 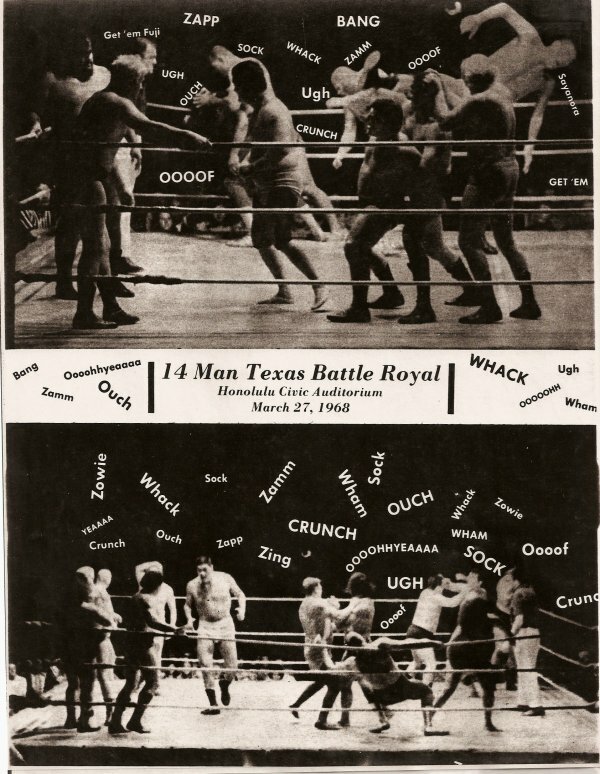 Wrestling matches at that time were held at the CIVIC AUDITORIUM on a weekly basis. FRANCIS, himself a professional wrestler, promoted wrestling every Wednesday night with such stars as BILLY WHITE WOLF, NEFF MAIAVA, CURTIS IAUKEA, LOU NEWMAN and others. The biggest event that occurred at the start of the FRANCIS promotion happened on August 30, 1961 at the Civic Auditorium during the main event: the HAWAIIAN CHAMPIONSHIP match between NEFF MAIAVA and CURTIS IAUKEA. During the match MAIAVA who was the champion attempted to headbutt IAUKEA, who was backed up against the ringpost. IAUKEA however ducked and MAIAVA hit his own head, was knocked unconscious for a least 15 min and was counted out and lost his Hawaiian title to IAUKEA. Wearing his championship belt, IAUKEA was walking back towards the locker room when wrestling fans tired to knock him down; IAUKEA ran inside the locker room and slammed the door. Wrestling fans, upset, tired to break into the locker room, fought with Police and a riot broke out. Many fans and Police were injured and the event made front page headlines in the Honolulu papers. 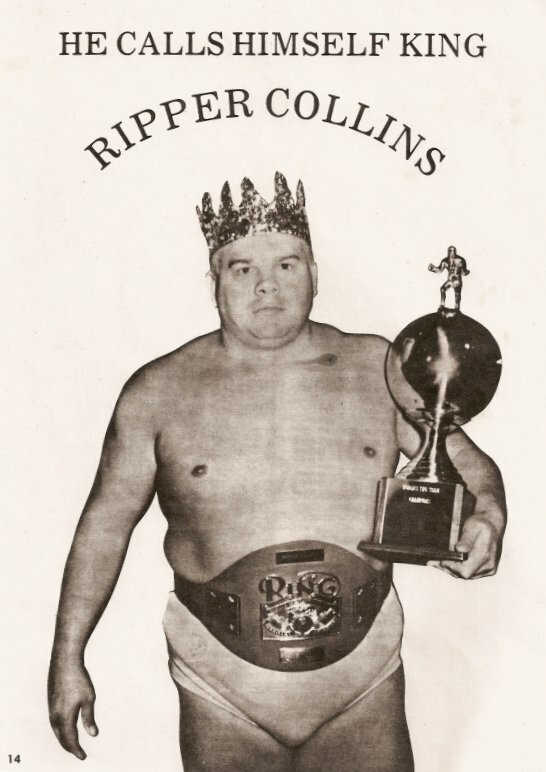 Throughout 1961, FRANCIS introduced wrestling fans to Texas Battle Royals, Indian Death Matches, Lady Wrestlers, and World Championship Matches with FREDDIE BLASSIE flying in from the West Coast to defend his world title. Heading into 1962, FRANCIS got his break when KHVH channel 4 started airing live wrestling matches every Saturday during a one hour show. A ring was set up in the studio and locker room interviews done to prompt upcoming weekly cards at the Civic Auditorium. The TV show allowed Francis to expand his wrestling cards to the Outer Islands (MAUI and the BIG ISLAND) and weekly cards every Sunday at the BLOCK ARENA: PEARL HARBOR and CONROY BOWL at SCHOFIELD ARMY BASE. Also in 1962 fans were introduced to THE MASKED EXECUTIONER and NICK BOCKWINKEL who was introduced as the UNITED STATES CHAMPION. On June 6, 1962 at the Civic Auditorium CURTIS IAUKEA defeated BOCKWINKEL for the UNITED STATES title and remained the Undisputed U.S. Champion until 1964 before losing his Championship to LUTHER LINDSAY.